The purpose of this study is to analyze our experience of 79 patients with various types of choledochal cyst treated in our institution and to highlight the results of hepaticodochoduodenostomy in a series of consecutive 53 patients. This is a retrospective study in which the children treated from January 1993 to August 2010 were analyzed for clinical presentation and investigation protocols. Baseline investigations included complete hemogram, urine examination, liver function tests, renal function tests and coagulation profile. 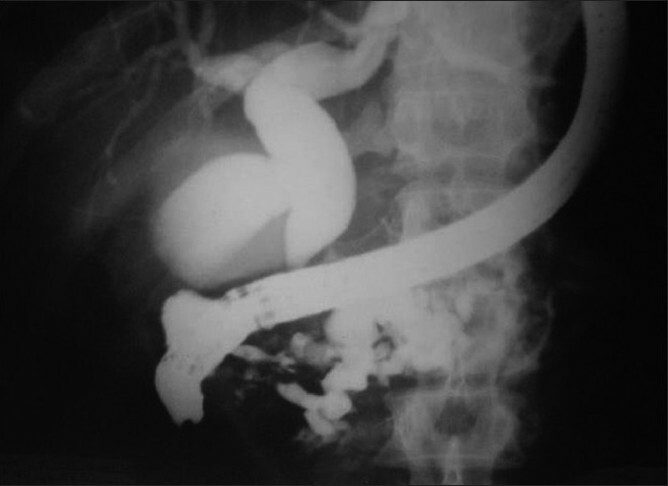 In the early 1990s, in addition to ultrasonography (USG) of abdomen, we performed contrast enhanced computed tomogram (CECT) of the abdomen, endoscopic retrograde cholangiopancreatogram (ERCP), operative cholangiogram and 99 m Tc-HIDA radionuclide scan. Lately, over the last ten years we are relying more on magnetic resonance cholangiopancreaticogram (MRCP) and also intraoperative examination of the ducts by cystoscope [Table 1]. After surgical intervention, our patients underwent regular follow-up in our outpatient department. History was taken particularly to pain, cholangitis, and any evidence of gastritis. Liver function tests, abdominal USG, and radionuclide scans to look for patency of anastomosis were done three months after the operation. Patients were followed up every three months in the first year and then once every six months. Differences between the two subsets of Roux-en-Y hepaticojejunostomy (24 patients) and hepaticodochoduodenostomy (53 patients) were compared using the chi-square test. Statistical significance was set at p <0.05. Seventy nine children with choledochal cyst were treated. There were 53 girls and 26 boys (female : male: 2.04 : 1). Thirty eight patients were below 4 years; 19 patients were between 4 and 8 years and 22 patients were above 8 to 12 years. [Table 2]. None of our patients was diagnosed antenatally. The youngest patient was three months old male infant. The patients were admitted with abdominal pain in 68 cases (86%), jaundice in 33 cases (42%), lump in 24 cases (30%) and biliary peritonitis due to spontaneous rupture of choledochal cyst in one patient. Classical triad of pain, lump and jaundice was seen in 17 cases (21.52%) of our patients. Two patients were operated elsewhere (one patient of cystojejunostomy and one patient of cystoduodenostomy) and subsequently referred to us. The different types of cysts in our series were as follows: Type I: 63; Type IV: 12; Forme fruste: 1; Caroli's disease (bilobar involvement): 1 [Figure 1]; extrahepatic choledochal cyst with atresia in the lower end of common bile duct: 2. 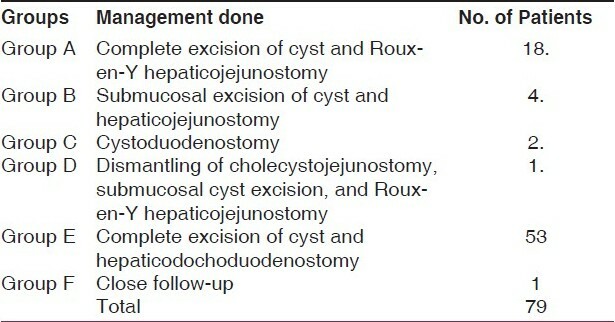 Group A - Complete excision of cyst and Roux-en-Y hepaticojejunostomy in 18: group B - Submucosal excision of cyst and Roux-en-Y hepaticojejunostomy in 4; and group C - cystoduodenostomy in 2, out of whom one was operated in another institution. (One patient underwent excision of cyst and Roux-en-Y hepaticojejunostomy. Other patient refused to undergo second operation.) Group D - One patient who was operated (cholecystojejunostomy) in another hospital with the diagnosis of pancreatic malignancy, was found to be having choledochal cyst with pancreatic calculi [Figure 2]. Dismantling of cholecystojejunostomy, submucosal cyst excision, and Roux-en-Y hepaticojejunostomy and side to side pancreaticojejunostomy was done in this child. Group E - Complete excision of cyst and hepaticodochoduodenostomy was done in 53 patients including one patient who had laparoscopic excision of cyst and hepaticodochoduodenostomy during a laparoscopy workshop in our institute. Group F - No operation has been done in Caroli's disease and the patient is under observation. In the last 30 consecutive cases, we have examined the cyst and the bile duct by 9-French telescope of cystoscope with 5-degree view during surgery. By doing this procedure we could see sludge in the common bile duct in six patients and we could also identify pancreatic duct in 15 cases. We could also identify the atretic variety of choledochal cyst by examining the duct through cystoscope. We operated one patient of ruptured choledochal cyst where complete excision and hepaticodochoduodenostomy was done and the patient had an uneventful recovery. No operation has been done in Caroli's disease patient. Liver biopsy was done in thirty patients to assess any structural changes in the liver. The patient with choledochal cyst and atretic lower end only showed cirrhotic changes in the liver. We do not have liver transplantation facilities in our institute and the patient is under observation. One patient of choledochal cyst with atresia at the lower end of the common bile duct had liver cirrhosis at the time of operation (operated at the age of 4 months). Even after excision of cyst and Roux-en-Y hepaticojejunostomy; the patient went into liver failure and died. Two patients of group A had recurrent pain abdomen and cholangitis. Both patients had USG abdomen, HIDA scan and MRCP. All these investigations showed anastomotic stricture. One patient required revision of stricture and the other refused operation and was thus lost to follow up. In group E, one patient had prolonged bile leak through the drain site but stopped spontaneously. Three other patients in group E developed occasional epigastric pain and responded to omeprazole. Endoscopy was done in all three patients but none of them had significant gastritis. One patient developed anastomotic stricture (the patient with forme fruste type cyst) and was lost to follow up. None of our patients developed intestinal obstruction or carcinoma. Five patients have been lost to follow up but the remaining 74 patients are doing well after a mean period of follow up of 9 years (range: 6 months to 17 years). A liver biopsy was done in the last thirty cases during operation and one of them showed evidence of liver cirrhosis and two patients showed features of periportal fibrosis as reported in the literature. , USG abdomen is the major diagnostic investigation and the accuracy of diagnosis and anatomical delineation is better when combined with MRCP. Postoperative radionuclide scan documents the patency of the anastomosis and is a useful tool in the postoperative period. In conclusion, complete excision of cyst and good bilioenteric anastomosis with wide stoma should be done at the earliest possible time. Hepaticodochoduodenostomy with wide stoma is a simple, quick procedure with preservation of normal anatomy and physiology and minimum of complications. It also avoids multiple intestinal anastomoses. 1. Liu BS, Shu YP, Xing KM, Cheng HP, Ying BL, Xiao PC. Diagnosis and treatment of congenital choledochal cyst: 20 years' experience in China. World J Gastroenterol 2001;7:733-4. 2. Stringer MD. Wide hilar hepatico-jejunostomy: The optimum method of reconstruction after choledochal cyst excision. Pediatr Surg Int 2007;23:529-32. 3. Shimotakahara A, Yamataka A, Yanai T, Kobayashi H, Okazaki T, Lane GJ, et al. Roux-en-Y hepaticojejunostomy or hepaticoduodenostomy for biliary reconstruction during the surgical treatment of Choledochal cyst: Which is better? Pediatr Surg Int 2005;21:5-7. 4. Todani T, Watanabe Y, Mizuguchi T, Fujii T, Toki A. Hepaticoduodenostomy at the hepatic hilum after excision of choledochal cyst. Am J Surg 1981;142:584-7. 5. Narasimha Rao KL, Mitra SK, Kochher R, Thapa BR, Nagi B, Katariya S, et al. Jejunal interposition hepaticoduodenostomy for choledochal cyst. Am J Gastroenterol 1987;82:1042-5. 6. Liem NT, Dung LA, Son TN. Laparoscopic complete cyst excision and hepaticoduodenostomy for choledochal cyst: Early results in 74 cases. J Laparoendosc Adv Surg Tech 2009;19:87-90. 7. Srimurthy KR, Ramesh S. Laparoscopic management of pediatric choledochal cysts in developing countries: A review of 10 cases. Pediatr Surg Int 2006;22:144-9. 8. Nquyen Thanh L, Hien PD, Dung le A, Son TN. Laparoscopic repair of choledochal cyst: Lesson learned from 190 cases. J Pediatr Surg 2010;45:540-4. 9. Büyükyavuz I, Ekinci S, Ciftçi AO, Karnak I, Senocak ME, Tanyel FC, et al. A retrospective study of choledochal cyst: Clinical presentation, diagnosis and treatment. Turk J Pediatr 2003;45:321-5. 10. Saing H, Han H, Chan KL. Early and late results of excision of choledochal cysts. J Pediatr Surg 1997;32:1563:66. 11. Yamataka A, Ohshiro K, Okada Y, Hosoda Y, Fujiwara T, Kohno S, et al. Complications after cyst excision with hepaticoenterostomy for choledochal cysts and their surgical management in children versus adults. J Pediatr Surg 1997;32:1097-102. 12. 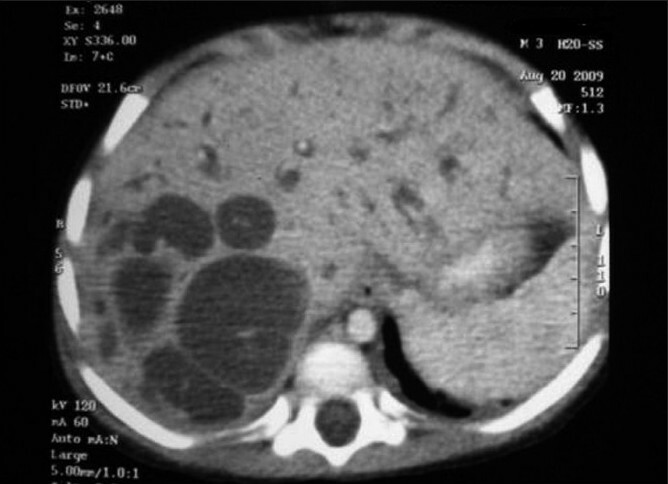 Kumar A, Gupta AK, Bhatnagar V. Choledochal cyst associated with extrahepatic bile duct atresia. J Indian Assoc Pediatr Surg 2005;10:48-9. 13. Kendrick ML, Nagorney DM. Bile duct cysts: Contemporary surgical management. Curr Opin Gastroenterol 2009;25:240-4. 14. Lipsett PA, Pitt HA. Surgical treatment of choledochal cysts. J Hepatobil Pancreat Surg 2003;10:352-9. 15. Miyano G, Yamataka A, Shimotakahara A, Kobayashi H, Lane GJ, Miyano T. Cholecystectomy alone is inadequate for treating forme fruste choledochal cyst: Evidence from a rare but important case report. Pediatr Surg Int 2005;21:61-3. 16. Suita S, Shono K, Kinugasa Y, Kubota M, Matsuo S. Influence of age on the presentation and outcome of choledochal cyst. J Pediatr Surg 1999;34:1765-8. 1 What is the Incidence of Biliary Carcinoma in Choledochal Cysts, When Do They Develop, and How Should it Affect Management?